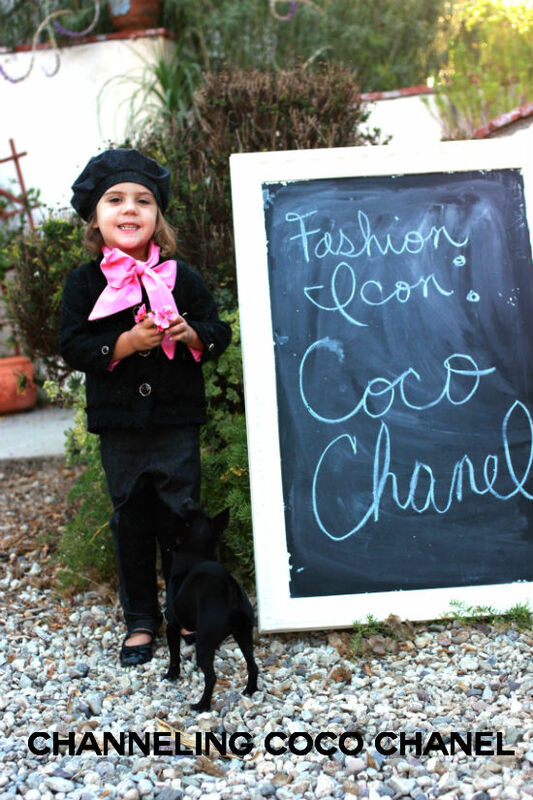 It's Friday again and time to vote on the Fashion Icon Challenge. Each designer chose their favorite icon and then designed, sewed and photographed a look for us today! Be sure to scroll down to see all the outfits before voting. They all put so much work into each piece---don't you agree? Remember it's one vote per computer (or IP address). Good luck designers and happy weekend everyone! I love Stella Mccartney's style and designs- she melds modern and vintage so perfectly with clean lines and sweet details. I swoon over anything she has a hand in, and love the way she incorporates classic pieces and makes them hip. The band jacket was a must for me, and with lace details and gold buttons it has a hint of femininity. The "maestro" style top was a labor of love with all the pleats on the bodice, and the capris are perfectly tailored to accentuate the shape of the tops. 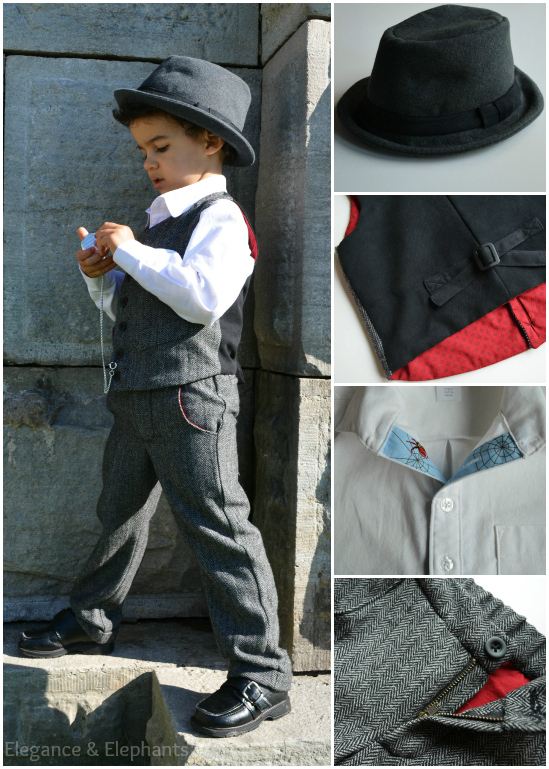 From the trimmed cuffs to the pleats in the pant leg, little details really gave this look the Stella touch. See more photos HERE. For this weeks challenge I decided to make two looks based upon one of my favorite fashion icons...Nicole Richie. I pretty much love her boho chic style, it is very flowy with lots of draping. She pairs prints with solids and she just has a knack for layering and accessorizing. Now taking her style and making it into wearable toddler clothes was a little bit of a challenge but I think I was able to do it. The long boho maxi dress was by far the most challenge piece I have made. Making this flowy dress without elastic or gathering at the top was something that took a lot of thought. But I finally came up with the perfect shape that is flowy around her middle but fits perfectly around the chest and neckline without any gathering. 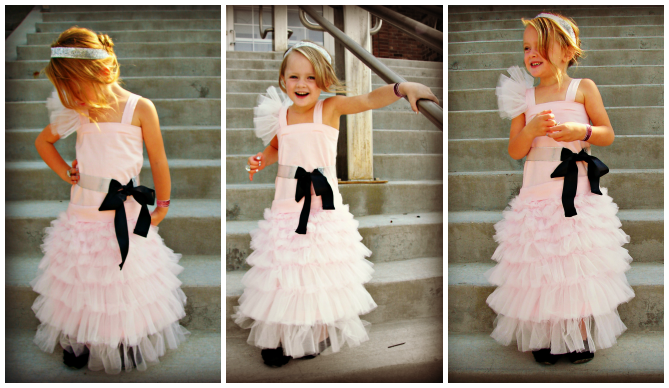 Then once the main part of the dress was made I added a ruffled collar and a ruffled piece to the bottom of the dress just to make it a little more toddler friendly. My little girl was looking more like a 10 year old then a 3 year old. The closure in the back of the dress is a simple tie that I made from a long strip of fabric. Then to add a little more sweetness, I made a lace vest using 1/2 yard of fabric and draping it so that is flowed longer in the front and shorter in the back. I made it sleeve-less so that the longer sleeves from the dress could flow freely. To finish off the look I made a belt using the lace fabric and added some knit as well as some leather from a belt I had on hand. And of course a bag was a must! So I made a slouchy bag out of denim and then added a handle made from the knit and lace fabrics that I had left over. Then I added the buckle part of the belt to the front of the bag for a little detail. The second Boho Kiddo look was a little more casual. For this look I made 4 pieces. The shirt was made the same way as I made the dress but just shorter in the length and longer on the sleeves. I used the same fabric tie closure on this shirt as I did in the dress but instead I put the tie in the front of the shirt instead of in the back. The vest was made out of corduroy fabric and is lined with purple lycra and pink. I simply layered the pink lace over the purple lycra to give it a little texture and contrast. For the tank top underneath the main shirt I used a simple design for the top and then added angled layers with the purple Lycra and pink lace to the bottom. Her pants bell bottom pants were made from some super stretchy denim-looking fabric. Layering was key in this look much like Nicole's personal style. I love how these looks are wearable and comfortable for the kiddo's but still have the boho chic style. For more pictures head on over to my blog. I am completely and utterly thrilled to be here for another week! Woot woot! 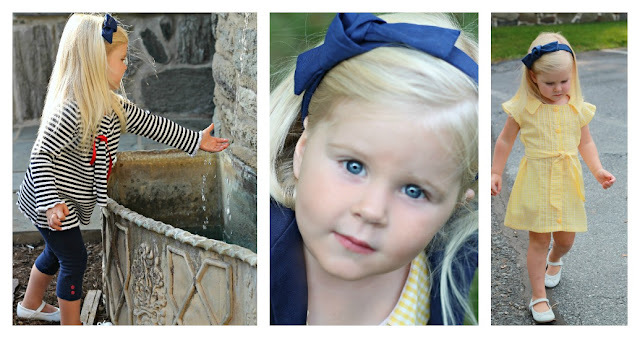 Okay, so this week's challenge was "Fashion Icon" and it was so incredibly hard for me to choose someone that would translate appropriately for an adorable 3 year old girl. I wanted it to be conservative, wearable, playful, and fresh. There are so many icons out there in the fashion world, but none seemed to have quite what I was looking for until I remembered how much I LOVE Kate Middleton's style! Classic, refined, and sophisticated, yet still young, fresh, and practical. Perfect! Plus, Ainsley looks absolutely adorable in navy blue and yellow. but i finally chose Cameron Diaz. love her...her style (mostly CASUAL style) her laugh, her personality. as usual..i only took a bazillion pictures..you can go HERE to check them out! One thing I knew for sure was I wanted to make a look for my boy. The next thing I knew was it had to be something classic/retro, because that's what I love. Then I thought of my favourite actors, and right near the top of the list is Johnny Depp. And when I started researching and found out he had recently been the only male to ever receive the Council of Fashion Designers of America Fashion Icon award, I knew my search for inspiration was over. My take on Johnny Depp's style includes a classic white cotton dress shirt complete with back box pleat, sleeve pleats, chest pocket, and functional cuffs. 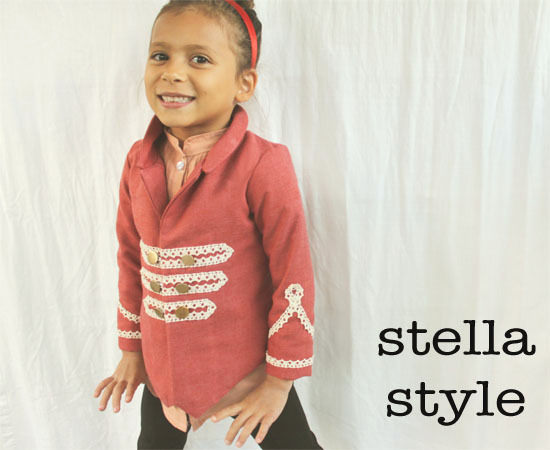 There's a fun, boyish element with the contrasting fabric on the inside of the button placket. The wool blend, herringbone dress pants feature a zipper fly, double back welt pockets, rounded front slant pockets, adjustable elastic waistband, and cuffed hems. You rarely see Johnny Depp without a vest, so I needed to make Tobias one as well. 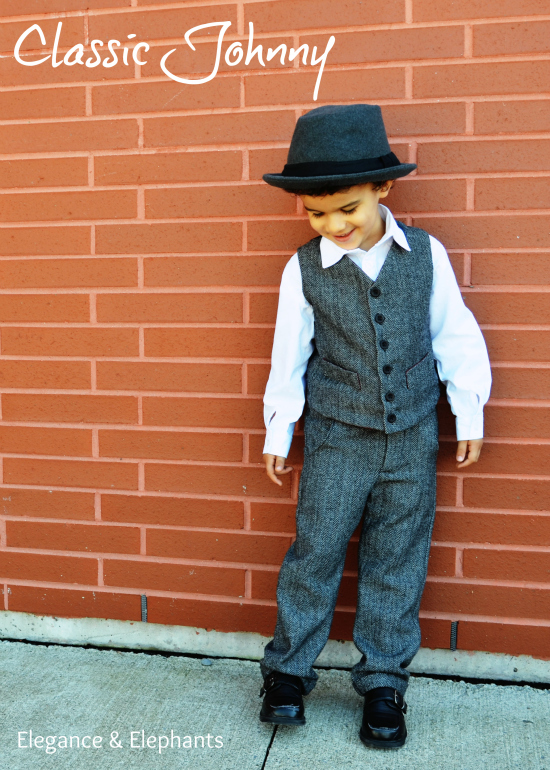 Mine is fully lined and made with a combination of wool blend, silk, and cotton fabrics. And to top it all off, a signature Johnny Depp style feature: the fedora hat. I constructed mine with poly/rayon blend fabric and a whole lot of interfacing. It is fully lined with the same fabric as the inner placket on the dress shirt. 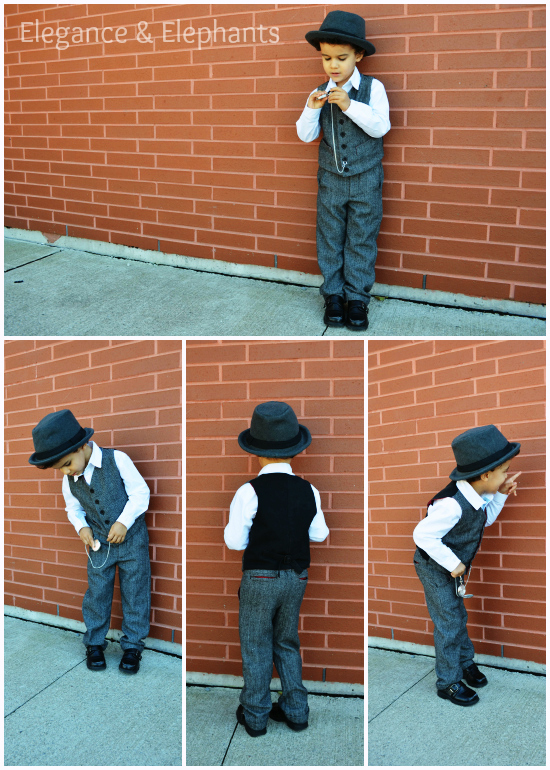 For more photos and details on the making of this look, come visit Elegance & Elephants. 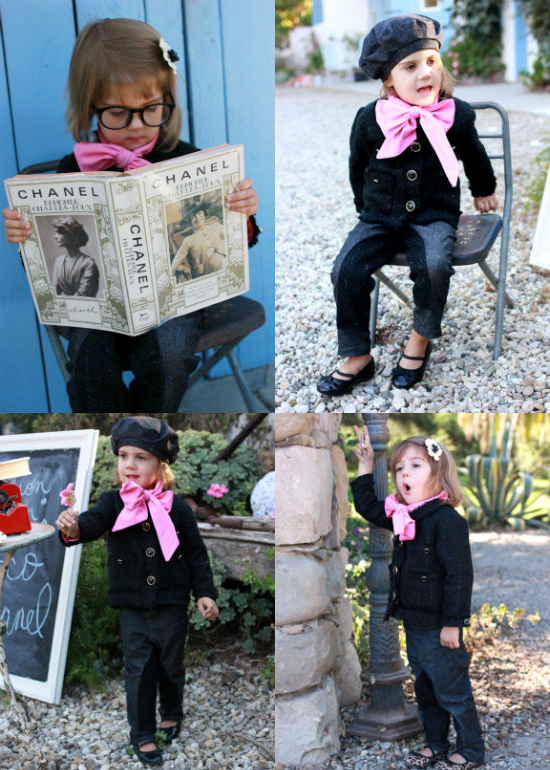 Todays' Lesson in Fashion Icons For Tots 101? 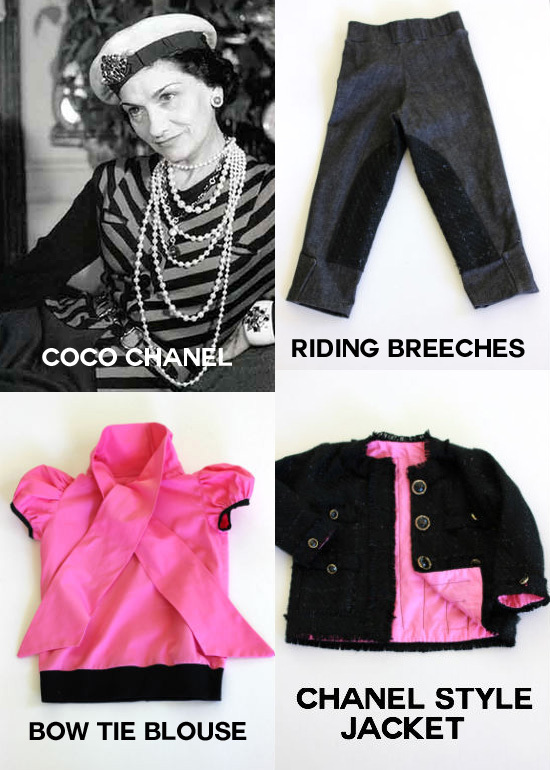 With all of the talk in the fashion world of Karl Lagefeld's new book, The Little Black Jacket, an homage to Ms. Coco Chanel, I thought I might make my own little black jacket for the toddler set here in Sew Country! I studied the construction of the Chanel jacket and applied some of the methods I learned to this little jacket, which is made from some metallic textured boucle fabric I found in the thrift shop and have had sitting in my stash. It is lined in the same pink fabric as the blouse and quilted together on the inside, with an attached fringe trim on the outside and lined patch pockets. And of course some fancy gold and black buttons to finish it. The on trend bow tie blouse is made from cotton sateen and has an attached collar/tie and a knit waistband to avoid it riding up and to make it more comfy. It also has puffed sleeves which I love for little girls, trimmed with black bias trim . I made the pants from some soft and stretchy black denim and tapered them to make them slim fitting. The inset panels are the same boucle fabric as the jacket, there is an elastic waistband, and there are little tabs on the bottoms of the pants to give them a more authentic, equestrian look. 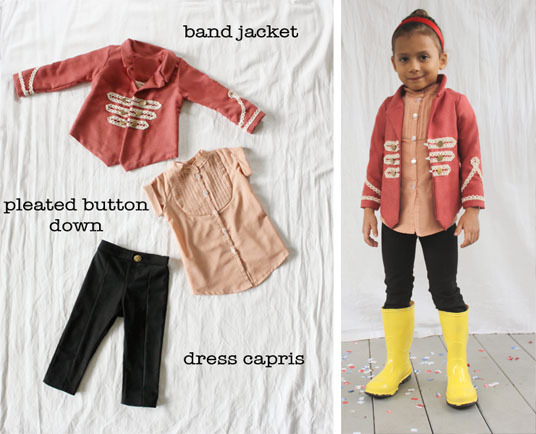 I drafted all of the patterns from the outfit with the help of my new pattern book, Metric Pattern Cutting For Children. I also made the beret at the last minute and the ceramic hairclip. The flower was a pin which I pried the pin part off of, then I glued it to one of my flat head bobby pins and I traced a dinner plate to make the beret. Gigi will not keep a clip in her hair or a hat on her head unless I bribe her with lollipops which I did plenty of in this shoot. She is now ready to attend the Polo match in this ensemble. Santa Barbara here we come! For fashion icon week, I chose Jacqueline Kennedy Onassis. Her aesthetic was clean, simple, classic and timeless, which is very much in keeping with my own point of view. 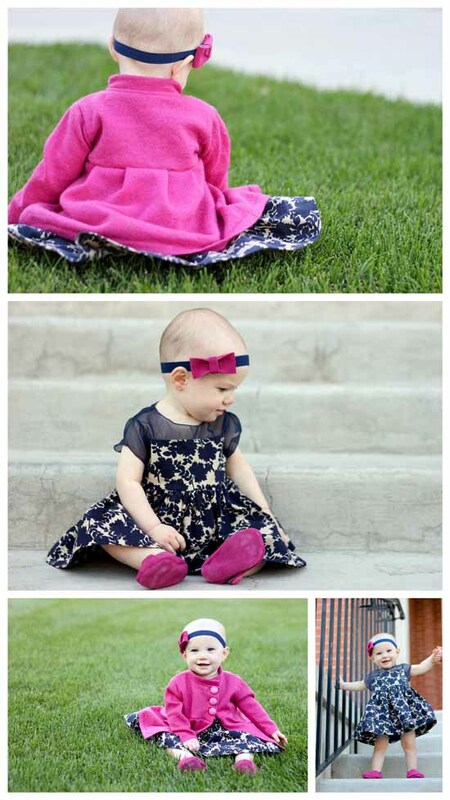 I didn't want to recreate her clothes per say, but I pulled details from a smattering of pictures of her, to come up with a outfit that I feel looks regal enough for a first lady and yet perfectly suitable for a baby. Hence, why I've called this ensemble, "First Baby." The dress begins with a sheer shoulder and sleeve made of navy organza, and is clasped in the back with a pearl button detail which I placed there as a nod to the pearl necklaces Jackie O is known for. The rest of the dress is made of cotton in a muted navy floral pattern and finishes in a nice full skirt. It wouldn't be a Jackie Kennedy outfit without a great jacket, so I made this 100% soft wool cardigan/jacket/sweater dress made from one of my old wool sweaters. It is a nice bright pink which complements navy nicely and is classic Jackie O. 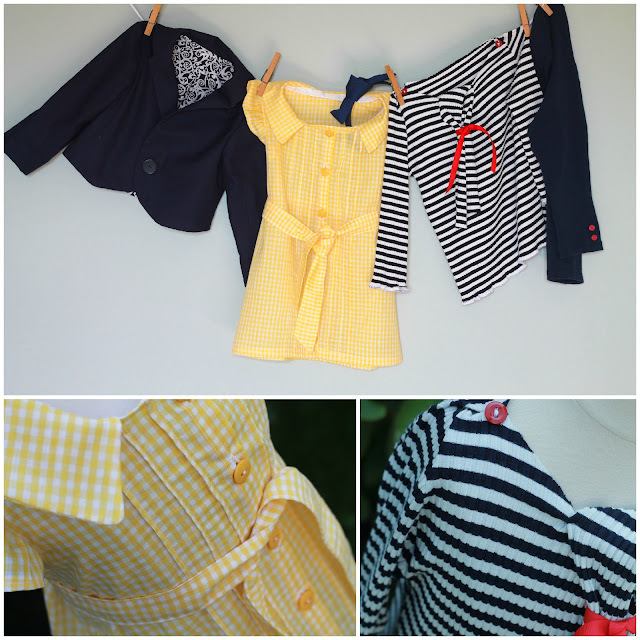 The buttons are large and bold, like many Jackie O jackets. 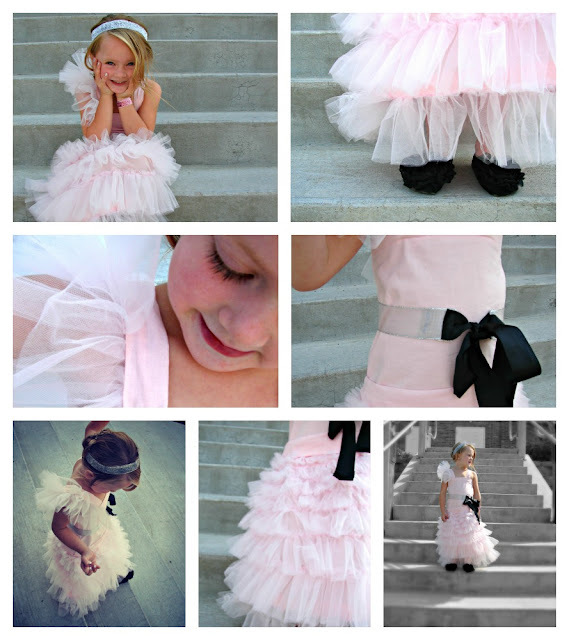 To tie everything together, I made pink leather shoes from a thrifted belt, navy polyester satin bloomers, and a head band and bow made from fold over elastic and leftover leather from the shoes. Please come by my blog: Delia Creates for lots more pictures, some close ups, and to see the pictures that inspired me! What?! No one did Lady Gaga?! ;) Wonderful ensembles, ladies!! Seriously, why didn't I think of Lady Gaga? It definitely would have been "fun"! Great job girls! It was so cool to finally see which icons we picked! Everyone did a fantastic job...it was hard to choose. Well done ladies! Everyone did a phenomenal job! great icon choices! The cameron one is too creative! Love all the styles, though!! Oh MY HEAVENS!! All of these kids look absolutely ADORABLE!! I especially love the First Baby!! 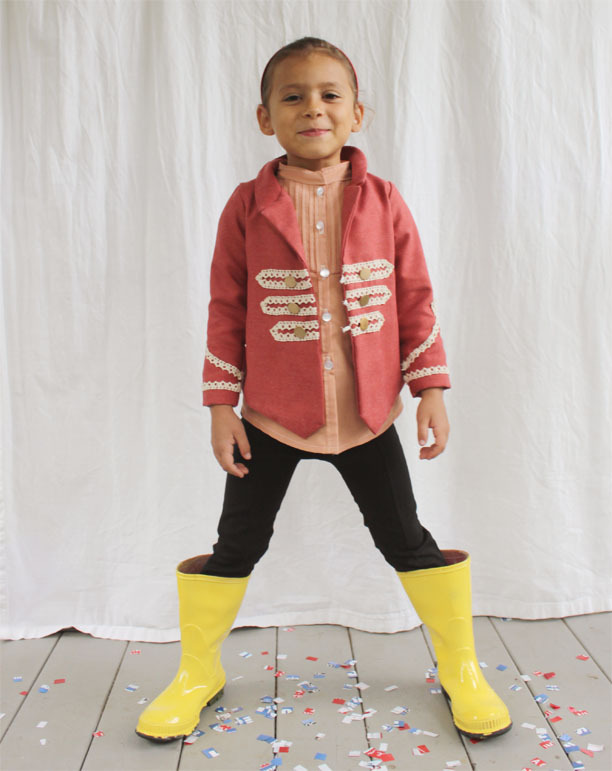 The little pink overcoat is just too cute! All of you ladies did a WONDERFUL JOB!! How do I choose just one? my jaw is on the floor!!!!! GOOD JOB!!!! 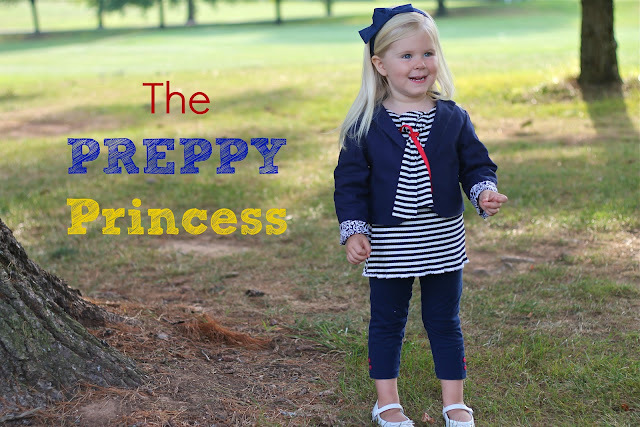 Love Hayley's preppy princess!! First baby is GORGEOUS!!! All of you ladies did a phenomenal job on this challenge! I am astonished and in awe over all of the fabulous details! Beautiful work! I was reading this in the mobile version on my ipod and couldnt't figure out where to vote. The poll didn't appear there, it was lucky i decided to come to the full pate version and found it so i could vote for my favorite! You have all put so much work and attention to detail into your projects. Great job!! I gotta say I LOVE Heidi's choice and look! Swoon! How in the world am I supposed to choose?! I want them all for my own kids. Oh wow, I wish I could vote for them all. So much work and detail went into all of the looks. First Baby is the cutest, I think as it stuck out (for me) from the rest. What creative talents you have here...it will be a hard decision. I loved this week's challenge! Each of you did such an amazing job. I simply cannot believe the care and attention that went into each piece! Beautiful work, everyone. It will be a hard choice! They are all amazing, but I love the Stella ensemble the most. Very chic and cute! My vote is for First Baby! I'm in love with the mini Cameron Diaz. That is adorable! Great job, ladies! It was awesome to see the translation of such iconic looks into children's outfits. You all did great!! I vote for Two Little Hooligans! I have to say Carmen Diaz! My vote is for the Stella look! Too cute!! I vote for the Cameron Diaz look. Oooh, Elegance and Elephants! I think they're all so well done and creative, but I love the fit and the detailing on Johnny there. I vote for Cameron and Kameron. Super cute.